A technical journal named The WCF Experimenter. Its Spring, 2016, issue has some interesting projects for both the advanced builder and those with more moderate skills. One of the latter articles describes an Arduino-based device for measuring the speed of sound at your location, by bouncing sound off a wall and measuring it's return time. It might be a good anesthetic for cabin fever. Stay out of unsafe (solder) joints. An excellent photo showing good, and poor, solder joints. Finally, one more post about capacitors and their markings. The above link is a bit more advanced, and broadens the discussion somewhat. But for now, we'll leave the truly advanced capacitor sites to experts in the field. For the benefit of hams who happen to be sighted, here are a couple of posts written by blind hams who routinely use soldering irons. There is more, very positive material, elsewhere on the Web. The first is a brief introduction to the subject. The next goes into more detail. The point of this post is...in amateur radio soldering, it's often safer if the blind lead the blind. ...continue reading "March 2016, General Membership Meeting"
Read B as 0.10 percent. Read C as 0.25 percent. Read D as 0.5 percent. Read E as 0.5 percent. This is a duplication of a D code. Read F as 1 percent. Read G as 2 percent. Read H as 3 percent. Read J as 5 percent. Read K as 10 percent. Read M as 20 percent. Read N as 0.05 percent. Read P as plus 100 percent to minus 0 percent. Read Z as plus 80 percent to minus 20 percent. The above was copied from this site, which adds a little bit more info. Next week, we'll talk about more naming schemes, and wind up with a couple of links which illustrate just how (unnessarily?) complex this subject can become. Let's say that this is the same capacitor, but under high magnification. But what does '104' mean? Is it some kind of model number? Inventory number? Does it mean nothing to anyone but space aliens? Nope. It tells you it's capacitance, in picofrads. The first two digits indicate part of it's capacitance value. The third digit indicates the number of zeros which follow the first two digits. You can also just drop the last three zeros and call it 100 nanofarads (100 nF). Both are the same value; they're just written differently. You can find out a bit more here. And even more, in a straight-to-the-point video, here. This begins a series of posts about stuff which is printed on the outside of capacitors. We'll deal with some of the schemes for indicating mF, uF, nf, and pF. 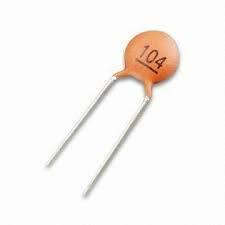 There are much larger capacitor values in other branches of electronics but we don't need to deal with that on a ham radio site. Next, we begin relating the above definitions to the many codes used by capacitor manufacturers. Meanwhile, there's more material about similar math notation on Wikipedia. Appropos of nothing: there are also the mathematical prefixes Zepto- and Yocto-, which are not needed here. They just sound like two long lost Marx brothers. You know, Groucho, Chico, Harpo, Zeppo, Gummo, Zepto, and Yocto.